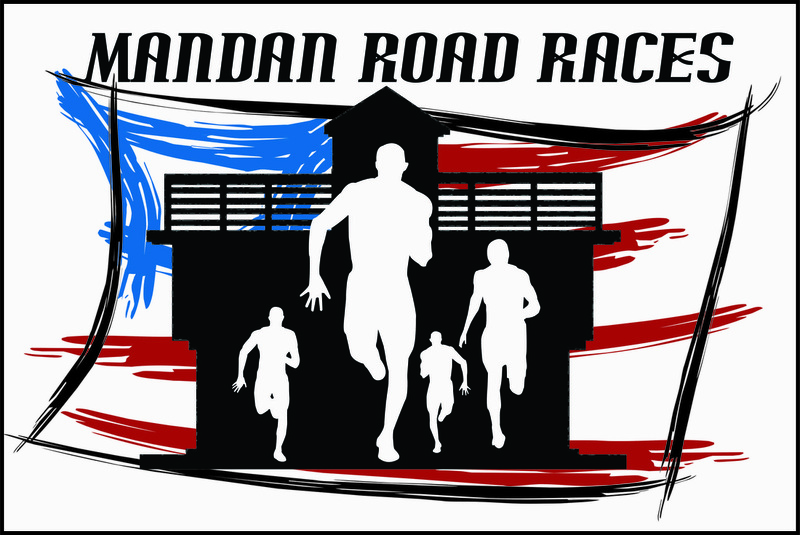 The 4th of July Mandan Road Race. Times: Day of Registration begins at 6:00am on Main Street in front of Mandan Heritage Plaza at the Intersection of 3rd Ave NW and West Main St.
Race Time: All Races begin at 8:00am. July 3rd in Art in the Park from 10:00am to 6:00pm at the Main St.
4th of July Registration: 6:00am - 7:30am on Main St. before the race. This race is the only race to date that has used the entire length of Mandan's Historic Main street. The only time you get to run Main Street is at the 4th of July Race. The race starts at the intersection of 3rd Ave NW and West Main Street. The runners will run about half a mile west on Main Street to 10th Ave NW and turn around and head east on Main Street to the turn around Just before Burger King on east Main Street and then returns to the starting area in front of the Mandan Depot. The route gives the runners the benefit of having the cheers of thousands of spectators waiting for the Mandan Independence Day Parade to start. The course is relatively flat and has the potential to produce fast times. The Mandan Heritage Plaza Foundation has focused its fundraising activities on the revitalizing the Mandan Depot and Beanary and surrounding spaces. The current project is the installation of display panels that tell the history of Mandan and that area of town. The mission of the Bismarck Cancer Center is to make locally available, the highest quality, state-of-the-art radiation therapy services to persons with cancer within the Bismarck service area. Such services shall be delivered, insofar as possible, without regard to reimbursement, and always in a supportive, compassionate, and caring manner, and will include needed wrap-around services to both patients and their families, educational services, prevention and early detection initiatives, and survivorship programs. Provide, at the local level, the highest quality, state-of-the-art radiation therapy services to persons with cancer within the Bismarck service area. Supplement its radiation therapy services with needed wrap-around services to be available to both patients and their families. Ease the burden and stress of cancer patients and their families by providing assistance in access to and navigation fo both internal and external community cancer treatment systems. Offer, throughout its service area, cancer-related educational services, prevention and early detection initiatives, and survivorship programs. Deliver all these services, insofar as possible, without regard to reimbursement, and always in a supportive, compassionate, and caring manner.